American entertainment giant Starz is continuing to remove tweets that link to a TorrentFreak news report about leaked TV-shows. Even worse, it’s also targeting our follow-up article that discusses the overbroad takedown effort. These notices are having the opposite effect, however, as they’re only encouraging more people to share our coverage. Last week we posted a news article documenting how several TV-show episodes had leaked online before their official release. Due to the leaks, complete seasons of unreleased TV-shows such as “The Spanish Princess,” “Ramy,” and “The Red Line,” surfaced on pirate sites. In most cases, there were visible signs revealing that the leaks were sourced from promotional screeners. The leaks also hit Starz, as three then-unreleased episodes from its TV series “American Gods” appeared online as well. The American entertainment company was obviously not happy with that, but its response was rather unconventional. Soon after the news was published, Starz issued a takedown request through The Social Element Agency, requesting Twitter to remove our tweet to our own article. Twitter was quick to comply and removed the tweet that supposedly infringed Starz copyrights. We disagreed. The article in question never linked to any infringing material. It did include a screenshot from a leaked episode, showing the screener watermarks, but those watermarks were central to the story, as we explained in a follow-up piece. The good news is that many legal scholars, journalists, and lawyers agree with our stance. The Electronic Frontier Foundation (EFF), for example, responded that Starz has no right to silence TorrentFreak and also shared that opinion on Twitter, where many others chimed in as well. That’s when things started to spiral out of control. Starz takedown efforts only encouraged more people to share the original story about the leaks, which is a classic example of the ‘Streisand Effect’. However, Starz didn’t budge and issued takedown notices against those tweets as well. EFF’s tweet, for example, is no longer available now, as can be seen below. However, that was just the beginning. With more and more people chiming in over the weekend, Starz began to target tweets that linked to our follow-up article as well. 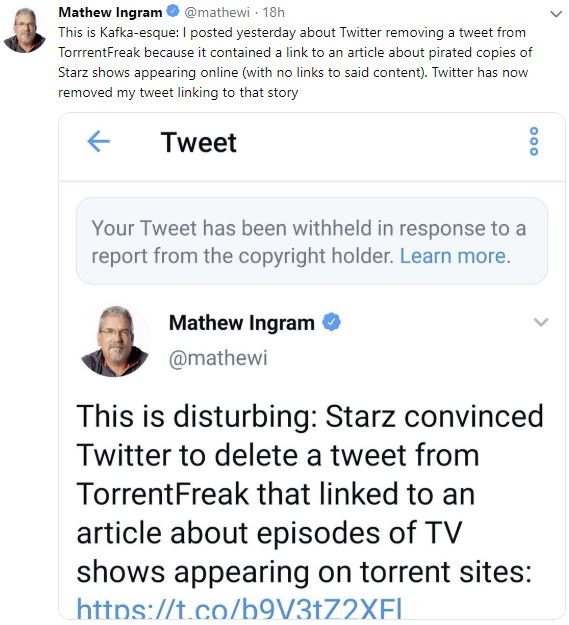 In other words, Starz started taking down tweets containing links to an article where we explained how a tweet to our original article about the leaks had been removed. This is what happened to Mathew Ingram who describes the situation as Kafka-esque. “I think it’s an egregious over-reaching interpretation of the DMCA and I’m disappointed that Twitter agreed to take my tweet down — and a similar tweet by the EFF — when they are clearly not infringing,” Ingram tells us, commenting on the removal. “And I think it’s extremely disturbing that Twitter is taking down tweets that merely have links to news articles in them,” he adds. Ingram’s tweet went viral and encouraged even more people to share our original article, as well as the follow-up. Wikipedia founder Jimmy Wales decided to join in as well, for example. Others saw it as a good opportunity to cross a Twitter goal from their bucket lists, such as journalist Rob Pegoraro. The overzealous takedown requests (we counted more than two dozen) are no joke, of course. And there are plenty of legal scholars who are not happy with this type of overreach. This includes Annemarie Bridy, who kindly backs us amidst all this drama. Ironically, Bridy also posted a tweet that linked to our follow up coverage about the removed tweets, which was removed as well. To stop this type of abuse, she suggests changing the law so that senders of these type of notices can be held accountable. “We really need a statutory cause of action—with statutory damages equal to those for infringement & attorneys fees—for copyright misuse. It currently exists only as an empty letter in the DMCA and a useless equitable defense to a claim of infringement,” Bridy notes. EFF is similarly critical. The digital rights organization labels Starz efforts as overzealous and has filed a counternotice to get their own tweet restored. The most recent takedown requests are different from the one we received. They are sent directly by a Starz “Digital Marketing Specialist,” and not through a third-party company. TorrentFreak previously reached out to Starz’ representative for a comment on the takedown efforts, but we have yet to receive a reply. Many agree that the broad takedown requests go too far and, at this point, we don’t think that Starz is very happy with it either. Instead of suppressing the news about the leaks, the takedown notices are only encouraging more people to share it. Update: Starz informs Variety that it apologizes for “inadvertently” taking down tweets. Our tweet and those of others have been restored. “That was never our intention and we apologize to those who were incorrectly targeted,” the network adds. The initial takedown notice we received didn’t appear completely inadvertent, as it specifically mentioned “images of the unreleased episodes” and “information about their illegal availability” as the reason to take the link to our reporting down.